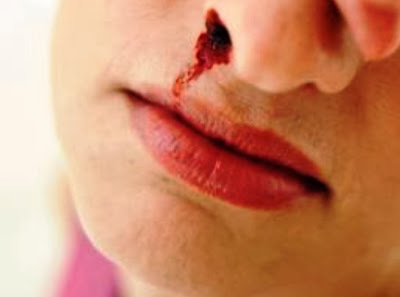 How to Overcome Nosebleed, Nosebleed is bleeding out of the process of the nasal cavity. The cause of nosebleeds can be of various factors such as the weather, dengue fever, tumors, cold, flu, sinusitis, was hit and others. This causes irritation of the nasal cavity or bleeding that ultimately lead to nosebleeds in your nasal cavity. 1. It is recommended to patients with bleeding in order to did not in a position to sleep, especially sleep on their backs. We recommend a good position is the sitting position. When the patient in a sleeping position, it causes the blood flow is getting stronger flow toward the tip of the nose. As with the sitting position, this position makes the blood flow to the nasal cavity is slightly reduced, because the nose position higher than the position of the heart. 2. Try to position the body was slightly bent forward, while pressing the bottom of the nose for about 10 minutes. If you feel the bleeding has stopped, you can gently remove it. 3. You can also give first aid to compress the cold water given to a washcloth or small towel. It is useful to make the blood flow to the nose to be a bit slow because the temperature is cooler blood will coagulate. 4. Do not look up it's head during a a nosebleed. This will make the blood flow that should come out through the nose, became distracted and can enter through the throat swallowed. It is very dangerous, and can cause shortness of breath and nausea. 5. If all of the above has been done, but the bleeding still occurs, it is advisable to immediately check into the nearest hospital or clinic around your home. Bleeding problems should consult this to your treating doctor. The doctor will give you the best advice and solutions to your problems.